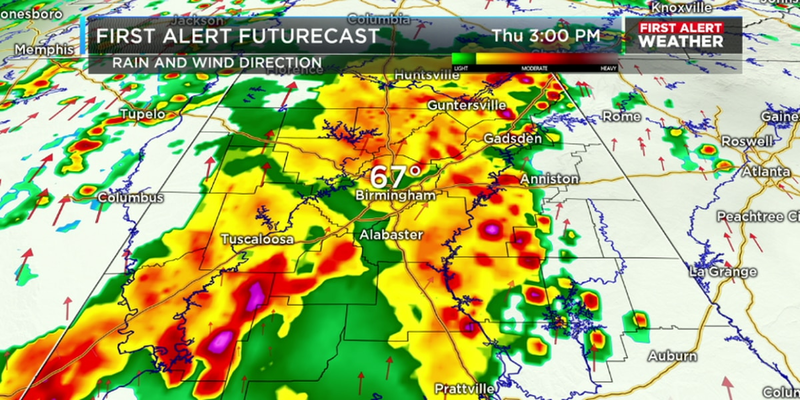 BIRMINGHAM, AL (WBRC) - We’re experiencing another weather transition in Alabama, with a cold and dry air mass slowly being replaced by another moist air mass. The sky will remain cloudy through tonight, with a chance of scattered showers as an east-southeast wind returns. Most of the wet weather is expected after midnight so you should be in good shape if you have big plans for this Saturday evening. I would grab the jacket before you head out the door in the morning, with lows tumbling to near 40 degrees. There may be a few upper 30s on the map in areas to the north and east. The sky will remain cloudy throughout the day on Sunday, with more scattered showers and patchy drizzle. Comfort-wise, the chilly conditions will linger throughout the day, with highs only reaching the low 50s. Lows Monday morning will be in the upper 40s. FIRST ALERT FOR A POSSIBLE SEVERE THREAT BY EARLY TUESDAY: You will start to notice a big warm-up by late Monday as temperatures rebound into the 60s. Scattered showers will be possible on Monday but the better chance of rain will arrive Monday night and into Tuesday morning. A line of heavier rain and storms is expected to develop out ahead of a cold front and move across our area during the 3 a.m. to 10 a.m. time frame on Tuesday. The instability values appear to be rather limited, although increased wind shear has us concerned about a threat for an isolated tornado. This low end threat will quickly end by lunchtime on Tuesday as another dry and stable air mass rushes into the state. You can expect some clearing and colder weather for Wednesday, with highs in the 50s and lows back in the 30s. ANOTHER CHANCE OF RAIN AND POSSIBLE STORMS LATE WEEK: The break in the rain won’t last long as a gusty southeast wind returns on Thursday. This will bring increasing clouds, with a chance of showers by Thursday evening. If you have dinner plans for Valentines Day, I’m thinking the heavier rain will hold off until later in the night. Heavier rain and possibly a few storms will impact the state early Friday, with dry weather returning just in time for the weekend. I will have more specifics on the storm chances for next week in my forecast this evening at 9, 9:30, and 10 p.m. on WBRC FOX6.